Synthesized peptide derived from human MMP16. HepG2 cell extracts; Human brain tissue. Our Abpromise guarantee covers the use of ab53145 in the following tested applications. WB 1/500 - 1/1000. Predicted molecular weight: 57 kDa. 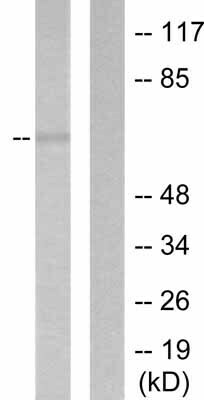 Endopeptidase that degrades various components of the extracellular matrix, such as collagen type III and fibronectin. Activates progelatinase A. Involved in the matrix remodeling of blood vessels. Isoform short cleaves fibronectin and also collagen type III, but at lower rate. It has no effect on type I, II, IV and V collagen. However, upon interaction with CSPG4, it may be involved in degradation and invasion of type I collagen by melanoma cells. Expressed in heart, brain, placenta, ovary and small intestine. Isoform Short is found in the ovary. Expressed in tissues undergoing reconstruction. Present in fetal tissues, especially in brain. Expression seems to decline with advanced development. Cell membrane. Localized at the cell surface of melanoma cells and Secreted > extracellular space > extracellular matrix. Cell surface. Localized at the cell surface of melanoma cells. Publishing research using ab53145? Please let us know so that we can cite the reference in this datasheet. There are currently no Customer reviews or Questions for ab53145.